This book took me through the NikEfex Pro 2 HDR software in a logical way so I could use it immediately. I worked with some images on my desk top as I worked through the text on my tablet. This was written by someone who understands the software and can explain how to use it in a step by step manner. At no time did I have to go the Google for an explanation, well done Robin! If you’re interested in creating impressive, high quality photography then you should take some time experiment with HDR to understand what advantage this technique now offers. Even if you dislike HDR, please suspend your judgement for a moment and read on. What if you could control this false appearance so that it was only applied against images where it was well suited? Suppose instead you could create a wide range of “looks” so that natural subjects remained natural but the results improved what could otherwise be achieved with a single exposure? Under these circumstances you might well consider HDR a valuable technique to be used in your photography. HDR Efex Pro is an advanced software tool that can give you this level of control. Once you understand how to use this valuable software together with the other elements of the Nik Collection you will be able to apply impressive improvements to your photography. Best of all, this software which used to cost hundreds of dollars/pounds is now available for free following a decision by Google. No longer will your camera sensor limit your imagination and photography. 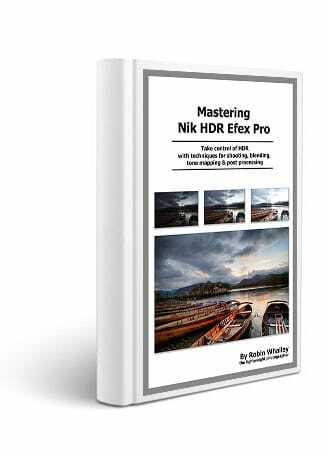 •All the features of HDR Efex Pro 2 as well as how to control the HDR effects that can be created. •An approach to shooting HDR image sequences as well as the common problems you will face and how to avoid these. •How to deal with image alignment and ghosting issues. •How tone mapping works and how you can apply this to non HDR images. •When and how to pre-process images for improved HDR results. •How post production changes can be made to further enhance HDR images. The book also features three full length tutorials, all of which are supported by the image files that can be downloaded from the authors website. This allows you to follow the examples on your own computer so that you develop your own skills. Contained within the 170 plus pages is all the information you need to be able to master the control of HDR and apply this valuable technique to your photography. This is accompanied by some 164 images and screenshots to reinforce the material. If you are keen to produce high quality HDR results with images that match your vision this book can help.